Like real analysis, complex analysis has generated methods indispensable to mathematics and its applications. 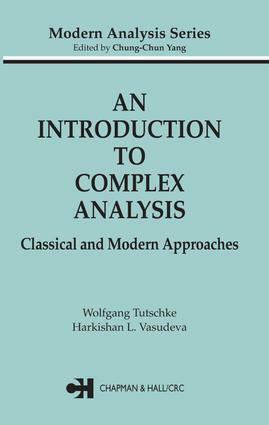 Exploring the interactions between these two branches, this book uses the results of real analysis to lay the foundations of complex analysis and presents a unified structure of mathematical analysis as a whole. Classical Approach. An Alternative Approach. Local Properties. Global Properties. Isolated Singularities. Homotopy. Residue Theory. Applications of Residue Calculus. Mapping Properties. Special Functions. Boundary Value Problems. References.